Port-au-Prince, Jan. 13 – Several hundred people had gathered to sing, clap and pray in an intersection here by 9 o’clock last night, a little more than four hours after an earthquake had devastated much of the Haitian capital. Another group was singing a block away, on the other side of the Hotel Oloffson, where I was camping out. I couldn’t make out many of the words. “Alleluia” was the refrain for some of the hymns the group at the crossroads sang. A minister was preaching to the other group about Bondye (“God”) and kretyen (“Christians”). The congregants replied with bursts of song. There were frequent aftershocks. With each tremor, the singing stopped and the singers wailed; after several minutes, the hymns would resume. Many of the people in the streets had lost their homes, but even those whose houses weren’t affected sat outdoors for fear of what might happen if they were inside when the aftershocks came. A great collective shout had risen from the city around 4:50 p.m. as the initial earthquake subsided. People ran into the streets here in the southern neighborhood of Carrefour Feuilles, just beginning to understand what had happened to them. Some seemed stunned, but many started walking – presumably they’d been at work and now wanted to get home to see about their families and their houses. People also began seeking help for the injured. A man was using a wheelbarrow to bring a woman to a car; a group of men were carrying an injured person on planks they had arranged to make a sort of stretcher. A dead woman or girl lay a few yards from the singers at the intersection; part of the wall around the hotel grounds had fallen on her. At first we thought she was one of the vendors who had been working there in the afternoon, but later we noticed she was carrying a book bag – probably she was a schoolgirl on her way home from school. By this morning someone had covered her with a colorfully printed sheet. Passersby stopped to lift the sheet to see if she was a friend or a relative. Then they lowered it and went on with their search. 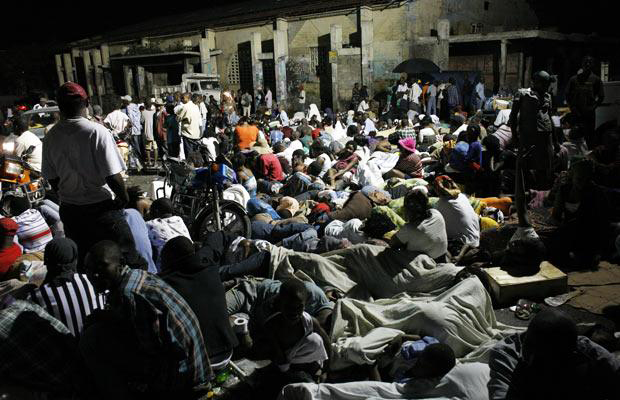 Port-au-Prince residents had no choice but to rely on themselves and Bondye. A Haitian American journalism student told us he’d seen Haitian police and a few of the 9,000 members of MINUSTAH – the United Nations Stabilization Mission in Haiti – directing traffic and picking up bodies in other areas of the city. But the only organized response the rest of us saw yesterday was what looked like a white MINUSTAH helicopter flying high above the city about an hour after the first shock, apparently surveying the damage. At about 4 o’clock this morning I saw a United Nations truck filled with soldiers on the street outside. They only stopped long enough for the singers to open a path for them. After that I saw no sign that there was a Haitian government or an “international peacekeeping force” – no police taking the injured to the few clinics still standing, no MINUSTAH soldiers arranging shelters for the people praying in the streets. They were all remarkably in tune with each other – I never heard a crowd in the United States singing like that. The beautiful music continued through the night. David L. Wilson is co-author, with Jane Guskin, of “The Politics of Immigration: Questions and Answers” (Monthly Review Press, 2007) and co-editor of “Weekly News Update on the Americas.” This story previously appeared in the Monthly Review. Beautiful story. Thank you. I’m posting to “No Shock Doctrine for Haiti” on Facebook. Dear Annie, this story touched me. I feel so sorry for that disaster that our friends in Haiti have faced. I imagined about that school girl who was lying there dead. Its so absurd.Thanks for posting this.